Who knew that the lowly earthworm could be interesting enough to keep someone entertained for 40 years? Like me, Darwin came to love and appreciate the noble earthworm as an indispensable participant in the creation of soil, and therefore the creation of food, and thereby the sustenance of humankind. Though we don’t often think about it, without the earthworm, we would be in deep doo doo. Knee deep. Maybe even buried. Okay - not exactly - because earthworms don’t usually decompose animal waste, but rather dead plant material. Earthworms perform the critical job of breaking it down into tiny bits, at the same time mixing it with good bacteria in their gut. When they poop out the leftovers near the surface, which are known as “worm castings”, they are leaving behind a concentrated source of both nutrients and beneficial microbes for plants. 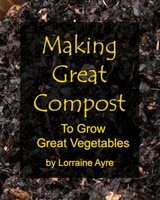 This makes them a critical part of healthy soil ecology and a healthy vegetable garden. The bacteria in the worm castings are also an extremely important part of soil ecology. Together with fungi, they act as a sort of external “digestive system” for plants, making mineral nutrition available in a form the plants can use. 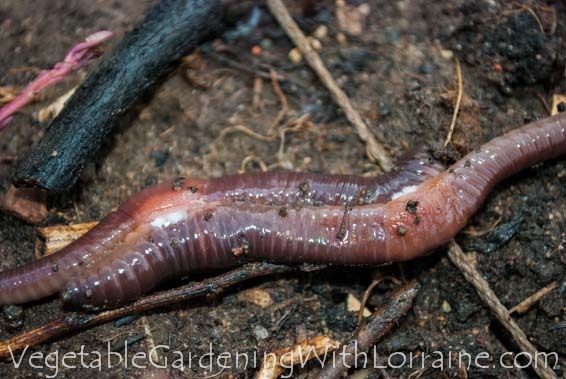 Earthworms are beneficial in the garden other ways, too. They also provide tunnels into the deeper soil levels, which allow air, water and plant roots to penetrate. The earthworm species that burrow deeply - like night crawlers, who can dig tunnels 6 feet down - also bring mineral nutrients from the subsoil back up to the surface, where they can be reached by plant roots. Earthworms also pull leaves and other bits of organic matter down into their burrows, to be eaten later, thus improving the levels of organic matter in the soil. Most agricultural methods are very damaging to earthworms, and land that has been under cultivation awhile may have only a quarter to a tenth of the earthworm populations that undisturbed forest or prairie soil would have. This is because tillage, compaction, and many chemical fertilizers kill earthworms and/or destroy their habitat. Most earthworms can live 4-8 years (with some variation by species), much longer than I would have guessed. The earthworm life cycle begins when they hatch out of little egg sacs that can contain up to 5 baby worms. In 2-3 months the babies will develop their own reproductive structures, and they are usually fully grown within about a year. Longevity depends on the species, but one report on night crawlers stated that they can live up to 20 years! (June 27) Every morning for the last few weeks I’ve been going out to the garden at 5:30 AM to pick slugs from my kale and collard beds (why I don’t beer-trap the slugs is another story). Today I was in for a surprise. Here and there all over the surface of the garden were mating pairs of night crawlers. Why they all chose June 27 is a mystery, but somehow they all made a group decision that today was the day. Each worm had its own tail anchored in a burrow somewhere, while their head ends reached out to each other. Earthworms need to keep part of their body anchored in their burrow in case predators show up and they need to quickly retreat to safety. They can disappear underground in under a second if threatened, though it takes a bit longer if they are engaged. I tiptoed back inside to get my camera and tripod, and proceeded to watch and photograph them for the next hour and a half. Some of the worms had stretched themselves out 8” long on the surface in order to reach each other. Though they were connected, it didn’t look like much was happening. it was about as exciting as watching grass grow, but I wanted to make sure I didn’t miss anything. Now every earthworm is hermaphroditic, which means it has both male and female hardware. But in order to assure genetic diversity, they don’t fertilize their own eggs, but rather mate and exchange genetic material as sperm. Fertilization of the eggs, however, doesn’t happen just yet. The pink part of the worm, where the white spots are, is called the clitellum (see the photo above). With a 32-power hand lens I was able to see that the white spots were actually slowly moving oceans of white globules - the sperm exchange. I kept very still because I know that worms are extremely sensitive to ground vibrations, and didn’t want to disturb them. But still as I was, all of a sudden, as if on some cue - within about a 30-second period all the worms everywhere in the garden disengaged at the same time and retreated into their own burrows. The sun was up, and though it hadn’t fallen on them yet I think it must have been some threshold of light intensity that sent them back underground. In researching the earthworm life cycle, I found out that after each worm goes back in its burrow, it then secretes a donut-like structure around itself. The worm will then retreat backwards out of this ring, and as it does it deposits its own eggs and the acquired sperm into the gel of the ring. It finally closes this donut into a sac as it detaches itself. The worms often deposit these sacs on or near underground food sources, such as decaying chunks of plant material. The sacs look a bit like tiny lemons, or puffy sesame seeds. Fertilization occurs inside the sac, and in 2-4 weeks, newborn worms emerge from the sac that are about ¼-½” long. After hatching, it takes about 2-3 months for the baby worms to grow big enough to develop their own reproductive structures, and the earthworm life cycle begins again.